Meet Fitzcarmel LaMarre, 44-year-old graphic artist and painter. Fitzcarmel was born in Boston and moved to Miami, Florida when he was four, where he would spend the next 30 years of his life. During his time in South Florida, he graduated from high school and began a career as a graphic designer and freelance artist. He worked for several different companies before landing himself a job in California. He started working for NTS Group, a design firm that worked on some really cool projects in home entertainment packaging and advertising campaigns in Los Angeles. The owner also started a non-profit, Nuevo South, which is when the idea of working in the non-profit sector intrigued Fitzcarmel. Unfortunately, after the market crash in 2008, he found himself freelancing until ultimately unemployed. In 2010 he got back on his feet with design agency The CRP Group and even art directed the cover of Galaxy Quest Deluxe Edition packaging. Fitz would eventually move to South Dartmouth to be closer to family. Once he had moved to the area and began focusing on recreating his life as a traditional artist, he began painting and quickly got involved with the artist community at Gallery X. Under the tutelage of Chuck Hauck, former gallery President, he began to learn about the culture and the city and soon fell in love. After working with the New Bedford Art Museum’s ArtMobile, Fitz became extremely interested in bringing more free art to the youth of New Bedford. He began the Creative Oasis: Youth Arts Project in 2016-7, offer free art in three locations during spring vacation. He funded the program through grants he wrote offered by the New Bedford Cultural Council, which he would join and served. 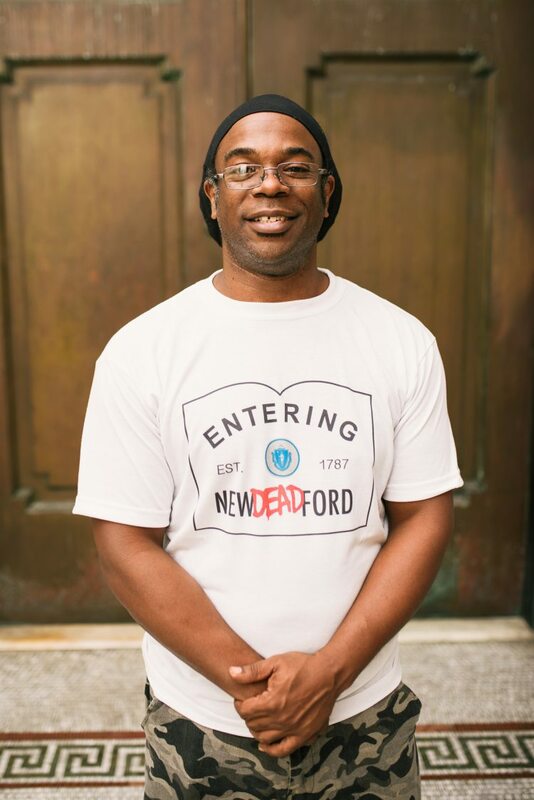 Most recently, Fitzcarmel has become one of four, new artists-in-residence with the New Bedford Whaling National Historical Park where he is creating the graphic novel, “New Deadford.” The story places New Bedford five years into a zombie apocalypse, showing how the diverse community works to make New Bedford the richest city in the world for the 3rd time. Taking this unique spin, he hopes to work with the National Park Service to raise awareness for the greatness of our community and the people who live here.